Motivation Plays A Huge Part In Your Self Improvement. It will your help your motivation and self improvement if you can set yourself a goal to work towards. See yourself achieve the goal in the future rather than trying to be successful within a next few days, or even weeks. It is a good idea to break your goal up into small goals and complete each one before continuing to the next. Goal setting is an important part of self improvement. This is a good personal growth strategy. 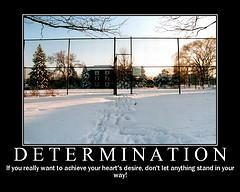 Be determined to stay motivated to succeed. Is there someone you admire? Someone at the top of his profession who you would like to base your achievement on. Has he written a book that you can read to apply some of his methods to your own life? Many people who are successful write about how they achieved their own personal empowerment. It is always good to learn from the experts. Read as much as you can of what they write and apply it, where possible, to your own self improvement. Learn everything you can about the area in your life you want to improve. At times you may feel a lack of motivation. Stay determined not to give in to this feeling. It's easy to lapse back and lose the personal growth and development you have achieved. Make your self talk positive. This will assist your self development. Your subconscious-mind will believe you when you say you can achieve. Keep repeating "I can and will do it," or other words you prefer that will help keep you motivated. Stay motivated and strong in your desire. Your confidence will build up as you work through each small goal. The closer you get to the main goal you will generate an amazing feeling of achievement. Always keep your thoughts on the transformation you are making in your self improvement. Keep your mind on the final goal. Stay motivated and enjoy the fulfillment and sense of achievement you feel when you succeed. Is it time to write a book? I hope so! You can achieve. Don't let fear hold you back Do you lack confidence?